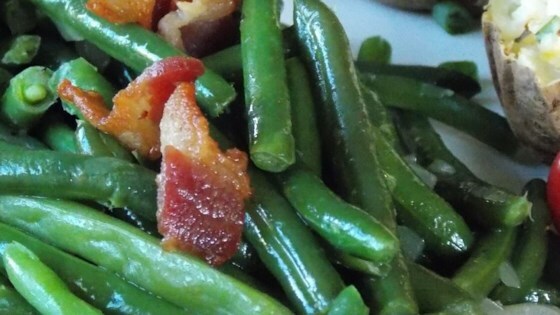 "Fresh green beans are cooked with bacon, onion, and garlic for a delicious side dish." Combine bacon, green beans, onion, butter, chicken broth, garlic, salt, and pepper in a saucepan. Cover and simmer on medium heat until beans are tender, 15 to 20 minutes. We did not like it. The best green beans I have ever eaten. Made exactly as written. PERFECT! !Just got some raw green beans from a friends garden. followed your recipe and they turned out great (omitted the salt). Went very well with our steaks and rice pilaf!